P!nk Makes Pink Even Better! An Amazing Pink Pup Story Worth Celebrating! There’s no question that there’s something to be said about Pink Pups. I know for a fact that true Pink Pups are driven by a non-relenting with to make the world a better place. On December 26, 2011 Good came head to head–heart to heart–against Evil. Someone threw a puppy out the window of a moving car off an overpass in Los Angeles. When Ace of Hearts Dog Rescue came to her, they found out she had three broken legs and needed immediate surgery. Because there is a God (dog spelled backwards) pop singer P!nk offered to pay for the surgery, which amounted to over $5,000.00. We are happy to report, that Stella, the pup, is doing well, and that, according to reports, she’s found a forever family. 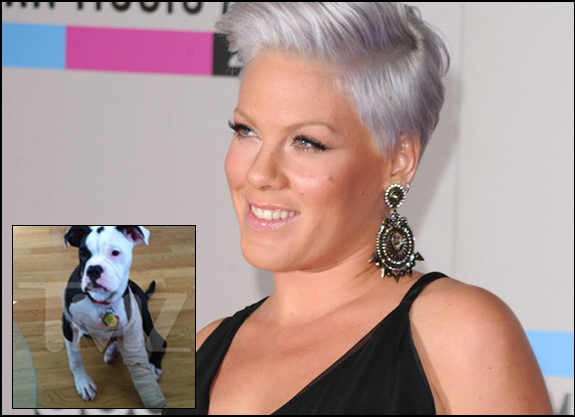 For her, for P!nk, and for everything good, we’re celebrating today with a Pink Pup Pawty! Let the celebrating begin! Use hashtag #PPPawty on Twitter. You can see us on Twitter, Tweetdeck or Tweetgrid. Help Yourself! We’re Not Your Mothers! HERE IS TO EVERYONE HAVING A GREAT PINK PUP FUN TIME! This entry was posted on December 31, 2011 at 12:02 am and is filed under Pink Pups, Twitter Adventures. You can follow any responses to this entry through the RSS 2.0 feed. You can leave a response, or trackback from your own site.